In the previous blog here we have seen how to get started with K8S easily with zero-installation using Play-With-Kubernetes (PWK). Everything happens in the remote machines, so nothing to install on the local machines. We can get started with K8S in less than 5-10 minutes using PWK. The main con of PWK is that the session is available for 4 hours and any modifications to the K8S cluster are lost. One easy way to use K8S locally is to use Minikube as mentioned here, but it provides a single node cluster and it makes it tough to test the different failure scenarios like a node going down and a few other things. In this blog we will try to install a multi-node K8S locally on the laptop as mentioned here, so that the changes are persisted across sessions. We should be able to continue from where we left. K8S-the-hard-way sets up a cluster from scratch, but it takes time and expertise. So, there are tools like kubeadm which abstracts and makes the installation process easier. 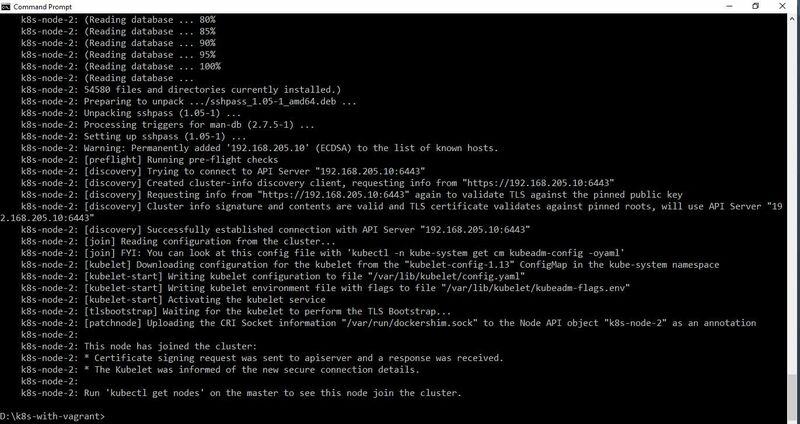 With kubeadm there are a sequence of steps to install a multi-node cluster on laptop. And for those who are new to Linux, it might be a pain. So, I was trying to figure out if the installation process using kubeadm can be automated using Vagrant. Tried a couple of hours, got stuck and gave up. And then luckily I found a ready made Vagrantfile from this article, which made the K8S installation process a breeze. 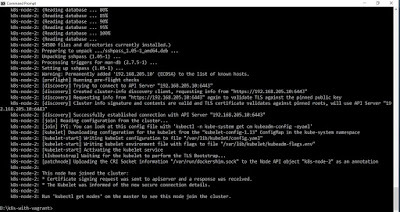 On a side node a multi-node K8S cluster can be run on the Cloud, but not every one is comfortable with the Cloud, so here are the steps using VirtualBox and Vagrant on the local machine. Step 1: Download and install the latest version of VirtualBox and then Vagrant. For the sake of Vagrant, you might have to restart the OS. The installation is pretty obvious as installing any other Windows software. Step 2: Make folder on the laptop and create a Vagrantfile with the content from here. If required the amount of Memory and CPU cores can be modified in this file. Step 3: Go to the above created folder and run the command 'vagrant up' from the Command Prompt. It takes a couple of minutes to create Virtual Machines in VirtualBox, download and install the K8S and the required binaries. The end screen will appear as shown below. And the Virtual Machines (k8s-head, k8s-node-1 and k8s-node-2) will appear as shown below. We are all set with the K8S installation. It's a piece of cake. It had never been easy to install softwares. Step 4: K8S follows a master-slave architecture. Login to the master using 'vagrant ssh k8s-head' and run the 'kubectl get nodes' to make sure all the nodes are ready. Step 5: Now lets create a deployment using the 'kubectl run nginx --image=nginx -r=4' and make sure it has been deployed using the 'kubectl get deployment' and 'kubectl get pods' commands. Step 6: Now if we want to destroy the cluster, run the 'vagrant destroy -f' command from the earlier created folder and the Virtual Machines will be shutdown and deleted. Step 7: During the installation if something goes wrong then it will be displayed on the screen and more details will be logged to 'ubuntu-xenial-16.04-cloudimg-console.log' file in the same folder. As seen above all it takes is a couple of steps to create a multi node K8S on the laptop. Now you should be all setup to get started and explore the world of K8S. Further nodes can be added by modifying the Vagrantfile and running the 'vagrant up' command. In the upcoming blogs, we will try to install additional packages or applications on top of the above K8S cluster and try different things with them. Note: Joserra in the comments points to the K8S blog on the same here. This blog uses VirtualBox and Vagrant. While the K8S blog uses Ansible to run the commands in the VM on top of VirtualBox and Vagrant. The end result of both of them are the same. Joserra - Looks like more or less the same. This blog article uses VirtualBox, while the K8S article uses a combination of VirtualBox and Ansible. The results are the same. Thanks for pointing to the article. I will mention it in this blog.